Learn about the brand new Chime Guest Experience. These features include how guests can choose a problem tag, look at suggestions, and start a chat! Learn how a manager can set up routing tags and suggestions for the Guest home page. Learn how to let guests select problem tags from the Skype for Business Client. Learn about the brand new Chime Guest Experience. Learn how a virtual agent can integrate Chime with Service Now. Learn how to use Chime outages to display issues to customers or employees coming in on the web client. Learn about some of the newest features for sending enterprise IM alerts in Chime 2.5. Learn about adding problem area skill tags when a guest initiates a chat. See the new Chime Presence and Health Monitoring features. Learn how to install and configure the awesome little Chime Agent Assist tool. Learn how a Chime virtual agent can assist a help desk agent by performing additional tasks while the agent is servicing chats. See how Chime can integrate with other service applications such as ServiceNow. 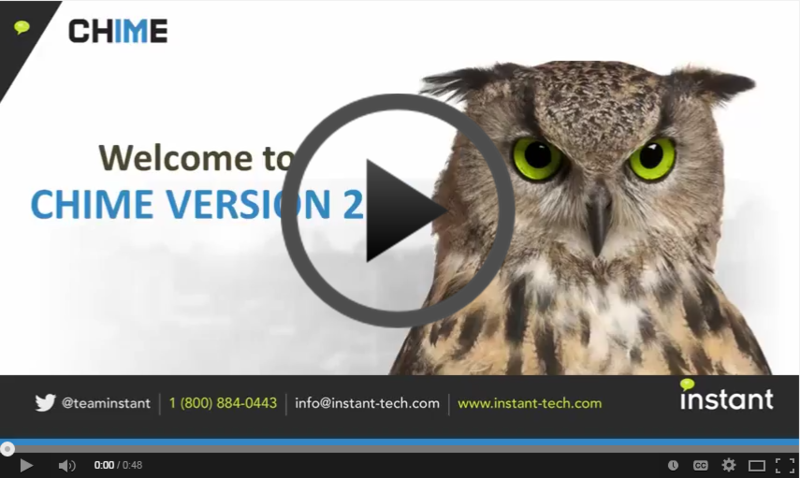 Watch this full but quick click-to-chat demo on many of the powerful features in Chime. Learn about the control panel in Chime for Office 365. See how you can easily connect to your Helpdesk via Lync. Learn how to track and monitor high level activity across the helpdesk. Demo of how ChimeHub works showing an example of an external site connecting to Chime through ChimeHub. Learn how to set up ChimeHub to expose your existing Chime instance to external networks or customers. How to transfer a chat by inviting another agent to join the conversation. Example of how to accept a chat as an agent using Microsoft Lync®. How the Chime client window extension works with Skype for Business®. Example of how an agent can upload a file to the seeker. Demonstrates how customers or employees can get help through Chime's click-to-chat application for Microsoft Lync®. Find and view the chat history of seekers' previous conversations. Shows managers and admins how to configure standard replies for agents to use. Some of the new features added to the Chime client window extension. Shows admins how to add a license key. Seekers can rate the agent and leave comments about their chat session. Schedule queues to turn on and off at specific times. Shows managers and admins how to add and remove agents to a queue. How to use Email Transcript feature to request an email containing a transcript of the chat. Agents can send the seeker a link and step up that conversation into a screen sharing session. A brief look at some of the many new features of Chime 2.0.